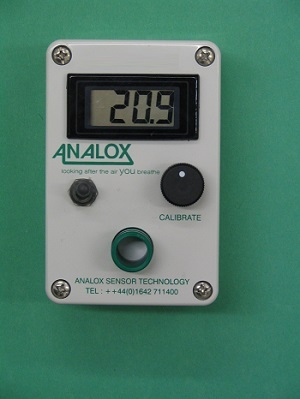 The Analox O2 Portable Oxygen Analyser is perfect for on-line O2 monitoring or for the verification of O2 levels from gas distribution panels, gas cylinders, to diving chambers and even compost heaps. Fast accurate response to changing oxygen levels. The O2 sensor is mounted internally to minimise the effects of temperature on the analysers performance. Different sampling adaptors for cylinder verification or in-line monitoring this rugged unit is both water and drop resistant and has even been used by the US Navy. Sensor comes complete with 3 year graded warranty. Gas companies - ensure your O2 cylinder mix is correct. Medical - ensures oxygen levels through gas distribution panels are correct. Diving - ensures correct oxygen mix for diving calculations. Compost - unit available with 1m probe and filter ensuring high quality compost.